Last night was the final NYC show “ever” for Nine Inch Nails. The last song was an appropriate cover of the Pere Ubu classic “Final Solution” where NIN were also joined by Bauhaus’s Peter Murphy for the second straight night. “Final Solution” contains the lyric “guitars gonna sound like a nuclear destruction” which could accurately describe the sonic wall of sound that NIN produced last night. 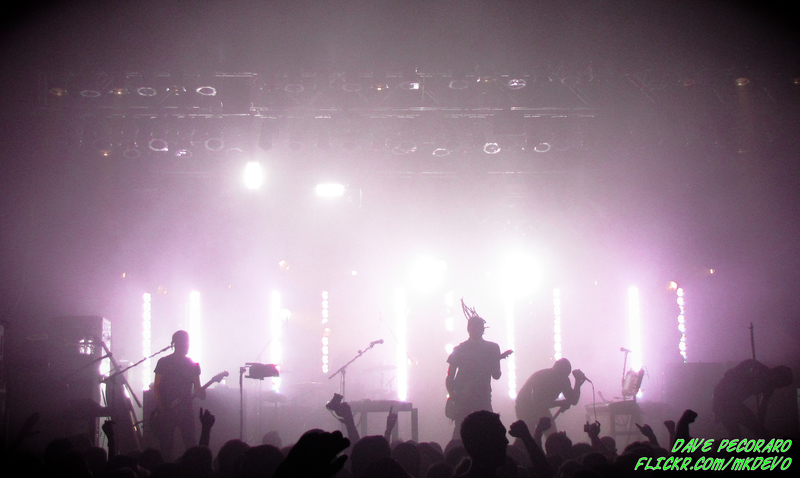 In what was clearly the best sound quality we have ever heard at Terminal 5, NIN vibrated throughout the cavernous venue with unmatched energy and intensity and ignited the oppressively packed and overheated crowd, who sang along in unison to nearly every number. There seemed to be no posers or yappers at this concert, only the diehards. Throughout the over two and a half hour set, the NIN setlist covered all aspects of their catalog from the very early (“Head Like a Hole”, “Terrible Lie”) to the latest (2008’s “1,000,000”) — all performed with the same level of conviction. 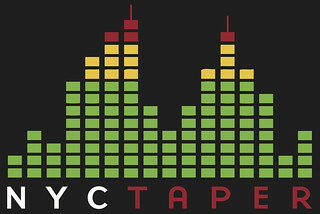 This recording is a true NYCTaper.com collaboration. I began recording from the perfect location with prime equipment, about two-thirds of the way back on the floor directly in front of the soundboard. As the heat and pressure of the crowd overwhelmed me halfway through the set, I had to leave for some air. Acidjack was standing next to me also recording, and his superb capture provides the second half of this recording. A seamless crossfade was applied and we challenge any listener to locate the exact point where the two nearly identical outstanding recordings were patched. Enjoy! If you email nyctaper for access to this recording, we expect that you will PLEASE SUPPORT Nine Inch Nails, visit their website, and purchase their official releases from the NIN Merch page at their site [HERE]. Thanks for the recording ! Have been reading about the last U.S. shows, would’ve been incredible. We saw them here in February (Australia) – truly amazing band / great live sound + lights show. FTW ! Thank you for recording this! Tuesday was phenomenal and I was sorry to not have been able to go see Mew open for them on Wednesday. I never saw them perform before, but was soo glad to have been able to be a part of this. I’m truly sad to see him retire the NIN touring band. i was at the show the previous night. it was a gloriously hot and sweaty night. when trent was talking about bringing out to stage someone he opened for a band in the early 90’s, i thought perry farrell was gonna roll up. not really a fan of bauhaus, so it was a little disappointing, but that’s the ONLY thing i could ever complain about during the course of the near flawless high energy performance. great recording once again!!!! I was there on 26th (day before my 20th birthday) and it phenomenal. The hottest show I had ever attended, but it was worth it. Even though I’m not a fan of Murphy, his glorious entrance and encore performance made up for anything. To those who do not know, Peter Murphy was lowered upside down from a chain to perform “Reptile.” Mind-blowing. Thanks for the killer audio! I’m going to the Wiltern and Echoplex shows and the wait is killing me. This will tide me over! Awesome. Thanks for sharing. I caught the Austin show on this tour. Have a great weekend. I will find the edit eventually! Thanks for recording this gents! Thank you! I can’t wait to listen. I failed to get tickets to the Chicago shows, so I will console myself by listening to this. wow! this is great! saw the show at bonnaroo this summer which was originally supposed to be the last US show. Phenomenal live performance they put on! Very excited to have this audio. Excellent recording, was upset I couldn’t go but this is almost as good!!! by one of our readers. Thanks! It’s been a while since I kept up with these guys and I had no idea this was their final tour. I missed the new york concert and I do regret missing it. I’ll definitely be checking out the live mp3’s on here and thanks again to the people that recorded! Holy S**t. This sounds FANATASTIC. Just like being there again. Are you game for us possibly using this audio for a multi cam mix that I and others are working on? Please email me if you have any problem with this. It would be free distribution and credit would be given. Cheers. Anybody have a link to a bootleg of the Bowery Ballroom show?? Thanks! I also wen’t to the 8-25-09 show. I also brougt a banner. Unforantelty mine was not nearly as personal. Mine Just read NIN. Thanks for this and for all the effort you obviously put into your articles and recordings. Thanks man. I was at this show- a real blessing. I only got into them heavily in the last year or so of their live playing. Was able to catch them four times, this being one. Very, very grateful, thanks for allowing me to relive this show even better. I’ll always remember this night. Come down and back to reality during “Something I can Never have” was mindblowing.